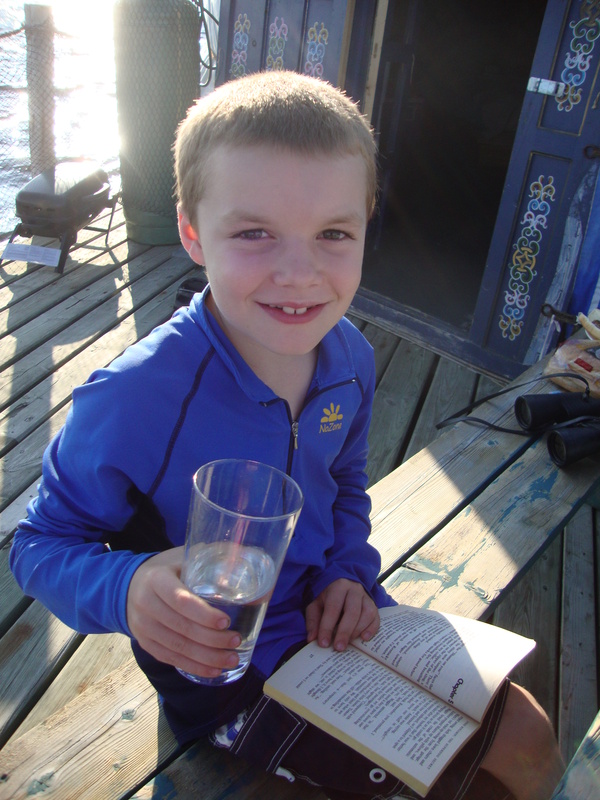 While in the Gaspe region of Quebec a couple of weeks ago, our family went on an adventure. Alas, it was one of the few flowerless excursions of my summer. Still, it was a fantastic sabbatical adventure! While getting ready for our trip I stumbled upon Aux 4 Vents. It offers overnight accomodation on the eastern side of the Gaspe, near the village of Carleton sur Mer where guests stay in yurts. 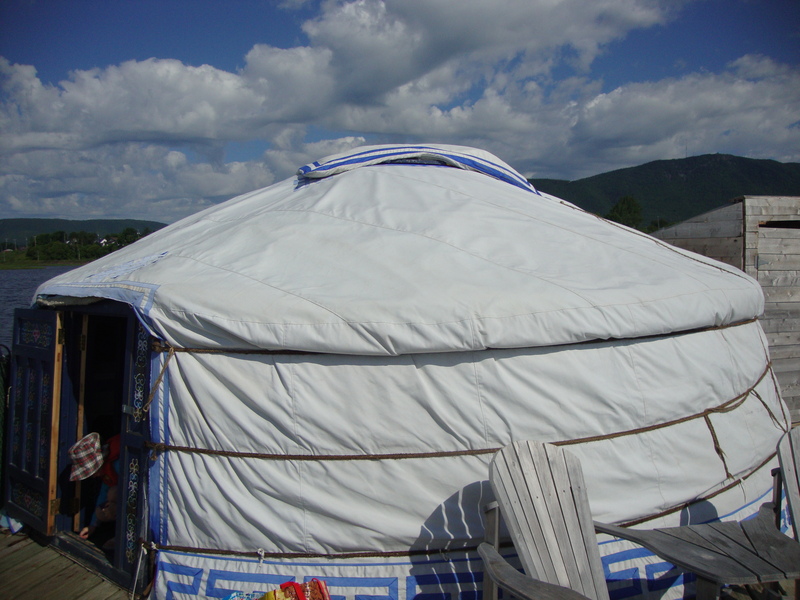 According to a BC yurt manufacturer, “The Yurt dates back to the time of Genghis Khan in the 13th century. Yurts have been used by generations of nomadic horse herders in Mongolia as portable homes which can be set up anywhere”. They are soft, round buildings that are surprisingly durable. 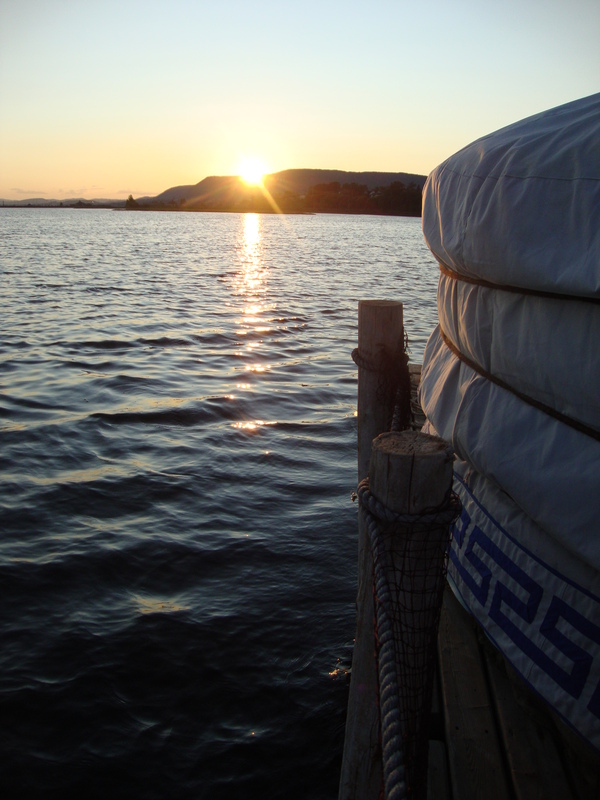 Aux 4 Vents, however, take this adventure a step further: their yurts are on floating platforms out on the ocean. Booking our overnight stay felt almost reckless with my fear and hope all jumbled up together. I almost had to close my eyes as I hit the “Reserve Now” button. How scary would it be? Would I lay in bed worrying all night, thinking we could capsize at any moment? Would the kids be afraid of being eaten by sharks? On the other hand, how incredible would it be to sleep out on the water, tucked away in our own private corner of the world? Maybe this would be one of those memorable moments that bonds the six of us together with nervous giggles and deep joy. The floating yurts turned out to be far more joyful than scary. Each one (the company had three in total) is permanently moored in a small, shallow bay with no boat traffic and no sharks. We happily paddled out, managing to keep our gear dry, and settled in. 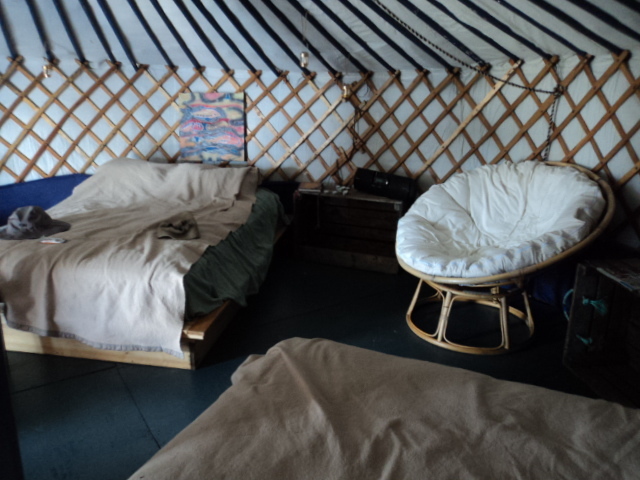 The yurt was well equipped with a picnic table, composting toilet and fresh water. My husband and I cooked a leisurely dinner while sipping a glass of wine and watching the herons who had congregated nearby. We played Yatzee and Scrabble with the kids as the sun made its slow, orange descent behind us. We slept well, and enjoyed the quiet, reading, talking, playing. It may not have had any flowers, but our yurt adventure turned out to be a lovely sabbatical time for our family. There was nowhere to go. There were no distractions. There was nothing to do except rest and relax and be together. Most of the time those moments are few and far between. Back in my non-sabbatical life, such slow, quiet evenings are all but non-existent. There is always a meeting or a rehearsal, a show to watch on television or a ringing telephone to answer. Out there on the bay of Carleton sur Mer, however, we were free from all of that. Such freedom is rare and sweet. I am glad to have our floating yurt memory, even if it was only 24 hours long. I will cling to it when I return to our hectic life in the fall. This entry was posted in Uncategorized and tagged family, memories, nature, rest, sabbatical. Bookmark the permalink.